There are a plenty of smartwatches in the market but most of them lack in one department or the other. Surprisingly, Samsung's Galaxy Watch ticks all the right boxes. There are a plenty of smartwatches in the market but most of them lack in one department or the other. Surprisingly, Samsung's Galaxy Watch ticks all the right boxes. It has got great looks, pairs instantly, fetches notifications in real time, is accurate with workout tracking and comes with a lasting battery. This is one sporty looking watch with a 42mm circular case. Change the watch face and it will complement your business attire. There is a bright 1.2-inch touch circular display with 360x360 pixels resolution, protected with a layer of Corning Gorilla Glass DX+. The circular bezel around the display supports rotating mechanism for navigating across the watch and even the user interface has been optimised for the same. In addition, there are just two keys on the right, where the one of the top takes to the previous screen and secondary key is used to access apps or watch faces. The latter, when long pressed, turns on/off the watch. The 49-gram circular case is accompanied with an interchangeable 20mm black band that makes it look dignified. Overall, the watch feels big and is on the heavier side. If you are on look for a bigger case, there is a 46mm watch variant with a 1.3-inch display. Unlike traditional analogue watches, smartwatches need to be configured before you start using one. Galaxy Watch took less than five minutes to configure with the Galaxy Wear app. Samsung has a common Wear app for all its smart wearables and I had to install additional plug-ins - Galaxy Watch Plug-in and Samsung Accessory Service - for pairing this one. While pairing the watch of Bluetooth connectivity, there was an option of managing app notifications on the watch. After a few seconds of inactivity, the watch display goes into the sleep mode and comes back to life, when the hand is raised or when the screen registers a touch. But there is 'always-on' option within the 'watch face' settings, which keeps it active when worn on the wrist. It continued showing the current watch face, just the way any analogue watch does. But keeping the watch face active at all times means quick battery discharge. Samsung's Gear Watch supports multiple input methods. You have the touch display and buttons on the side, but the rotating bezel makes it easy to navigate around the apps, notifications and more. So instead of touching the screen every time, rotating the bezel clockwise from the watch face showed different widgets, whereas turning it anticlockwise showed notifications. Complementing the design, apps are neatly placed in a circular format across multiple windows and I was able to browse through them by simply rotating the bezel. There are some nice watch faces that go well with the circular case. And I was able to download more free and paid ones from the dedicated watch face page. There is one to go with every occasion. For instance, I choose the Tissot watch face for an official meeting, switched to National flag watch face when felt patriotic while watching Border movie, and opted for a rugged watch face during adventure sports. There is a 'dual clock' watch face can come handy while travelling abroad. The Gear app is divided into three tabs. The first one shows information such as battery, storage, RAM, connection status and more. The second tab is dedicated to watch faces, while the third one is the key to all essential settings for customising the watch experience. Within settings is the touch sensitivity option, which when turned on, can be used to operate the watch while wearing gloves. The watch has a neat user interface, which is intuitive to use. It fetched all the relevant notifications including emails, messages, WhatsApp notification and more in real time. I was not just able to view notifications but even reply to them from the watch itself. For instance, I was able to respond to WhatsApp messages using the preset replies or using the on-screen keyboard. There is also an option to use Bixby. Smartwatches aren't meant for reading long format articles but when I came across an interesting read on Flipboard, with a simple tap, I was able to open the article on the respective app on the paired smartphone. Samsung with the Galaxy Watch has managed to address another pain point of smartwatches - battery. While most of the smartwatches barely manage to last a day with constant notifications, the Galaxy Watch lasted me over three days on a single charge. Apple Watch is one of the best smartwatches in the market but is restricted to iPhone users. 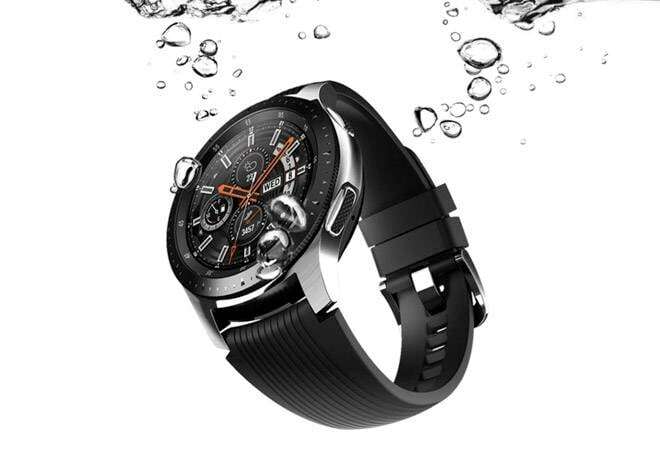 If you are an Android smartphone user and looking for a nice smartwatch, the Samsung Galaxy Watch is worth considering. Priced at Rs 24,990, this 42mm case in Black is worth investing.